No other soil amendment is as widely used by succulent growers and collectors as pumice (crushed lava rock). Here’s why. Pumice enhances drainage in garden beds. It absorbs excess moisture (is used for that purpose in horse stalls) so roots don’t rot in wet weather. It’s a natural, unprocessed organic product that comes from mines. It holds onto moisture. Although pumice may appear bone dry, compared to composted pine bark---a major component of bagged potting soils---it retains moisture up to 48 hours (in cool weather). Bark holds moisture about half as long. It releases moisture slowly, and at a steady rate. Tiny pores on the surface act as microscopic reservoirs to store moisture and nutrients. Depending on the mine it comes from, pumice may enrich soil with 70 or more beneficial trace minerals. It doesn’t decompose, rot or blow away. For succulents and other plants that can’t sit in wet soil, improve drainage by amending beds with a mix of 25% garden soil, 25% pumice, 25% compost and 25% sharp (large-grain) sand such as decomposed granite. Plant cactus and cactus-like plants that store moisture and that are exceptionally prone to rotting (such as fat euphorbias) in berms amended 50% with pumice. If amending the soil in a garden bed isn't an option, fill the planting hole with pumice so roots are surrounded by it, and so the crown of the plant doesn't touch soil. Use pumice as a topdressing to absorb rainwater that puddles around plants. For succulents and other plants endangered by soft, soggy soil, use a metal bar or broom handle to circle the plant with vertical tunnels (air holes) several feet deep. Space them 12-18 inches apart and about that far from the base of the plant. (The goal is to add pumice to the soil but not to damage roots.) Widen the openings at soil level a bit to make it easier to funnel pumice into them. It depends on the needs of individual plants, but for most succulents, simply mix half-and-half pumice with any inexpensive, bagged potting soil. For fine leaved succulents, I mix 40 percent pumice with 60 percent potting soil; for cacti and rotund euphorbias, the reverse (60 percent pumice and 40 percent potting soil). Growers often start rot-prone cuttings and offsets in pure pumice. Top-dress pots with it before adding crushed glass or florist’s marbles, so that the glass colors stay “true.” In my garden, I top-dressed my faux lily pond with pumice before adding crushed, tumbled blue-green glass and flat marbles. Cover spilled oil, grease, coolant, hydraulic fluid and other toxic liquids with a layer of pumice. After it absorbs the fluid, sweep it up and dispose of it in an environmentally friendly way. Call the closest and ask if they carry “Dry Stall.” Dry Stall is pumice from the same mines owned by General Pumice, and is sold in 40-lb bags. Half Moon Bay Feed has it for $18. Bay Area Hay and Feed in Livermore sells it for $16. The cost is much more than feed stores, but shipping is included. General Pumice is basically a mining operation that sells large quantities wholesale (Dry Stall is among their customers). General Pumice is owned by brother-and-sister Austin and Lexi Petelski, who hope to make the product widely available to gardeners via big box garden centers. They own two mines in the Owens Valley, CA, an unpopulated area with a geologic history of volcanic activity. 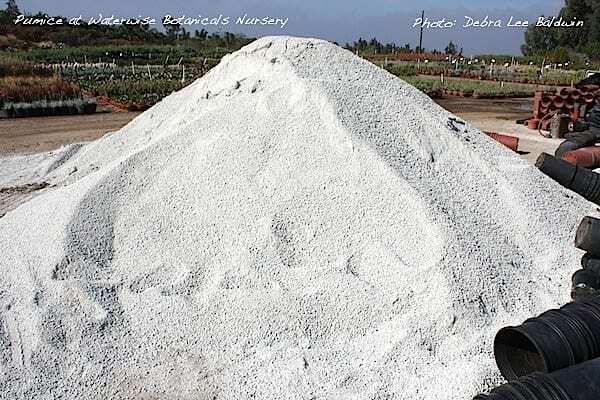 Both pumice and perlite are available via numerous vendors on Amazon, at prices similar to those of General Pumice. I prefer pumice from California mines due to its purity; also, pumice from other regions may be gray in color. Incidentally, pumice from CA mines is sold as a detox powder because it contains the mineral zeolite, which works at the cellular level to trap heavy metals and toxins. Some growers swear by perlite to lighten soils and enhance aeration. For years it was the industry standard. It’s the white bits in potting mixes. According to Austin Petelski of General Pumice, perlite is inert and inorganic, and is created by heating pumice to the point it pops like popcorn. My own experience is perlite floats to the surface of pots, and in the garden makes tidal drifts of white after watering. Nothing stands out in a garden more than white. Unlike perlite, pumice stays put. Substitution: Crushed lava rock also comes in black, red or brown. Used for ornamental purposes, it's available from landscape material (rock) suppliers. Smaller is better (1/4"). If not bagged, take your own 5-gallon bucket/s. Garden centers and nurseries also may carry it. On this page you'll find the essentials for growing succulents successfully.